Holt-Peterson Bus is a family-run business that takes pride in the business of serving people. It’s a simple philosophy, but one that is often forgotten in our industry. Whether we’re busy planning schedules, training drivers or servicing coaches, it all comes back to providing our customers with the best travel experience possible at the end of the day. 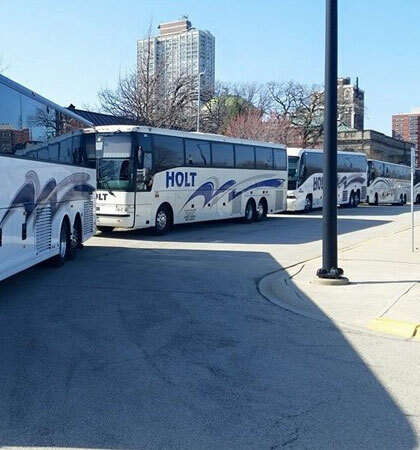 Holt-Peterson Bus has provided first-rate charter services for Central Minnesota and Minneapolis. We operate motor coaches of all sizes, and offer travel services throughout the continental United States and Canada. Holt-Peterson Bus employs a team of professionals that enjoy working with people. They embody a caring and dedication that is seldom seen in the service industry of this day and age. Our team of professional drivers are trained to the highest of standards. Let our drivers take care of the work while you safely enjoy your trip in comfort. As a family business, we consider our employees our most valuable asset. We think you will too! All of our equipment is stored indoors. Our fleet is professionally maintained at our own heavy truck/bus service center. We also stock parts and have a wash bay to keep our fleet clean and ready to travel.